When asked what my favorite cookie of all time is, I go through a list in my head: anise cookies, gingerbread, chocolate chip, peanut butter blossoms, nutella. I could probably name 50 more that would fall into the “Best Cookie” category. But this close to Christmas, my favorite switches from the every day cookie to one that has a special place in my heart. My recipe for Cranberry and Walnut Biscotti came about few years ago when I wanted to fill a cookie jar to use as a centerpiece. 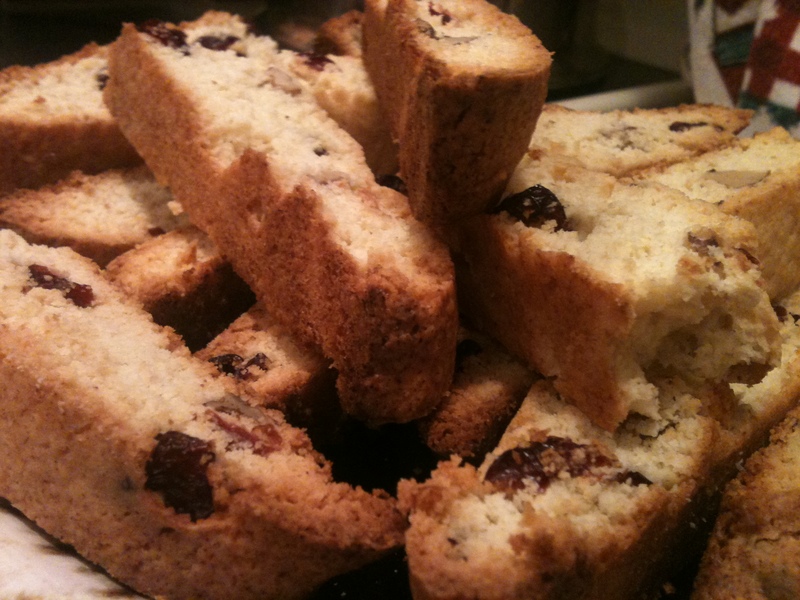 These biscotti are light and crunchy and won’t weigh you down after a big meal. Inspired by a Food Network chef, they have become a holiday staple for my family and a frequent gift for friends. Whisk together flour and baking powder in a medium size bowl. In the bowl of an electric stand mixer, combine margarine, sugar and lemon zest (or juice) until blended. Add eggs one at a time and beat until just incorporated. In batches, add flour mixture until blended (make sure it’s incorporated but be careful not to over mix.) Stir in walnuts and cranberries. Empty the dough onto the baking sheet. Wet your hands (the dough will be sticky) and form dough into a 12-inch by 3-inch log. Bake 40 minutes in preheated oven until golden brown. Let sit out of the oven for 20 minutes or until cool enough to handle. When the log is cool enough to touch, slice 1/2 inch diagonals using a sharp knife. (A serrated knife is best.) Arrange on same baking sheet cut side down and bake for another 15 minutes. Let cool completely and store in an airtight container. Serve with coffee, tea or a big glass of milk to dunk them in! These keep really well so give ’em as gifts for the holidays. It just may become the new favorite cookie in your life!